Tolls on the Humber Bridge will not be increased, it has been announced. The government said the tolls would remain at existing levels because of the current economic climate. 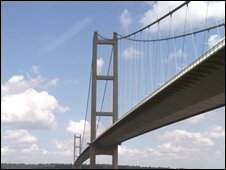 The Humber Bridge Board had proposed increasing the tolls from £2.70 to £2.90 for cars to help pay off the bridge's £333m debt. The decision not to increase the tolls was made by the Department for Transport (DfT). It considered a report after a public inquiry in March. Campaigners had called for the tolls to be scrapped. A year-long trial of a reduced charge of £1 was also proposed. Transport Minister Sadiq Khan said: "I do not believe it is right for the Humber Bridge tolls to be raised in the current economic climate and so, after careful consideration, I have decided not to accept the proposed increases. "This will help local people and businesses who rightly had concerns about the impact of increased tolls." Richard Kendall of Hull and Humber Chamber of Commerce said: "Increasing the tolls now would have been absolutely the wrong thing to do as we try to get through the recession." He added that they now planned to meet with government ministers to discuss reducing or scrapping the tolls. Graham Stuart, MP for Beverley and Holderness, said: "This is fantastic news for bridge users on both sides of the Humber. "People are desperate for jobs at the moment and the bridge should be a boost to local employment and not a barrier." The bridge was opened by the Queen in 1981.